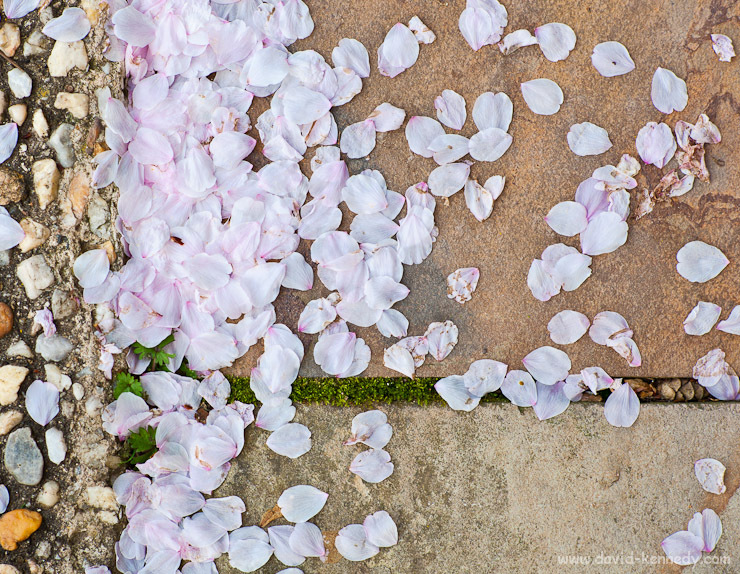 Wabi-sabi is a Japanese concept of beauty in imperfection and impermanence-- the adventurous ruggedness of driftwood, the comfort of faded denim, the legends in chipped teacups. There is nostalgia in this beauty, and a hint of sadness. 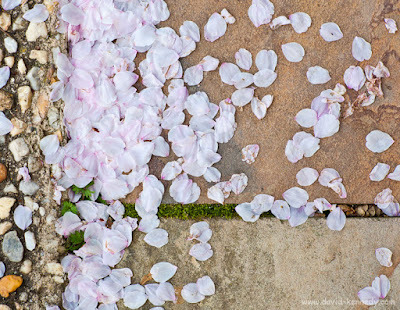 Artists who focus on blowing and falling petals, rather than newly opened blossoms, understand wabi-sabi. 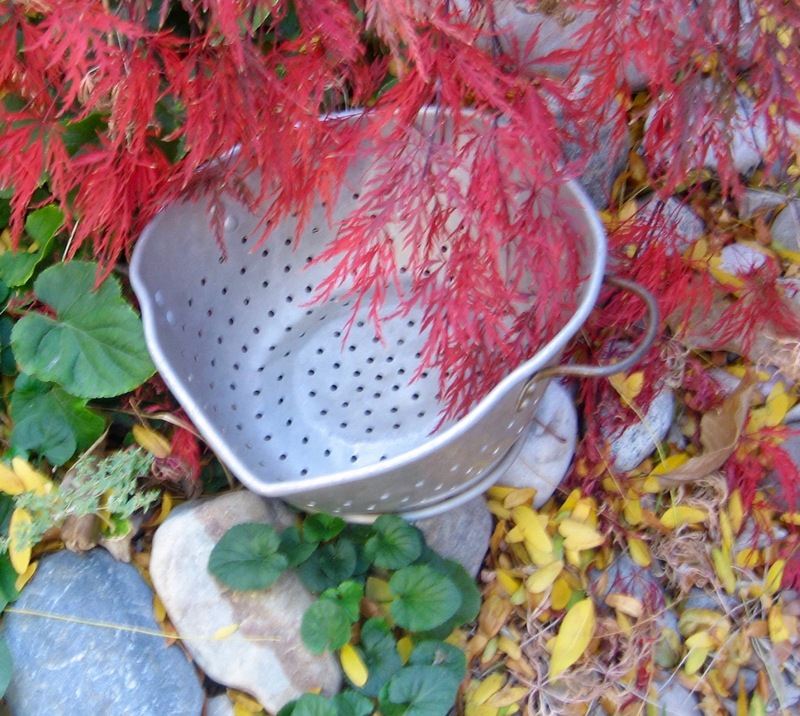 Fall leaves are a more timely example. Yesterday, my concord grape privacy hedge was golden and should have been photographed. Today it is mostly naked, revealing five shriveled grapes that were missed during the harvest. I did not know about wabi-sabi, when my mother gave me the old aluminum colander, but something in me saw it as beautiful. She gave it to me for my boys to play with. At least one of them was at a stage where he enjoyed pulling all my dishes out of the cupboards whenever I worked in the kitchen. I'm sure he kept making a mess as I started to use the colander to wash lettuce and drain spaghetti. But my husband objects to grimy-looking cooking tools. He has kindly replaced most of my kitchen twice now in our marriage. 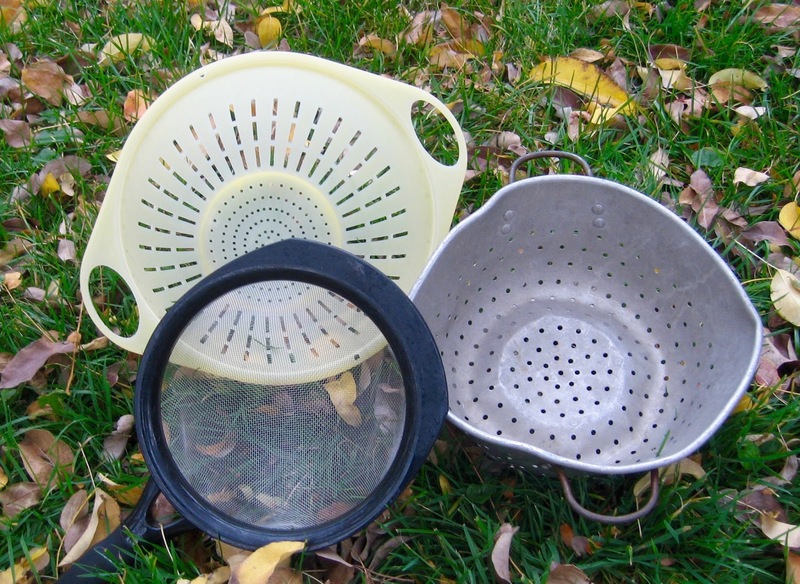 Shiny new colanders and strainers were included. 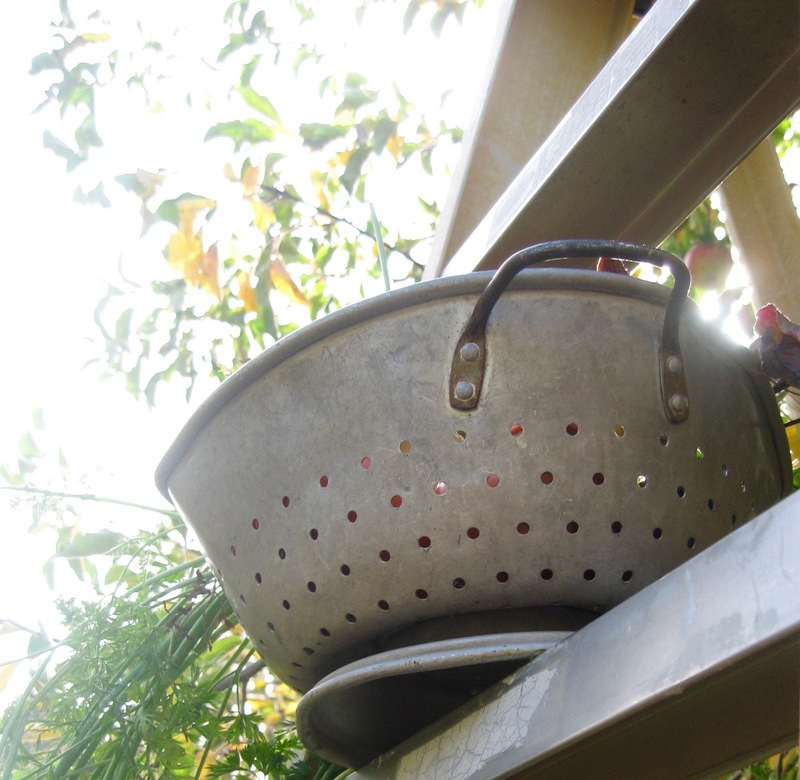 He told me I could get rid of the old one, like I threw out the rusty cheese graters. But I couldn't. Instead it has been moved to non-cooking tasks. It is my favorite vessel for foraging in the garden and for the many washings and rinsings involved when I work with raw wool. 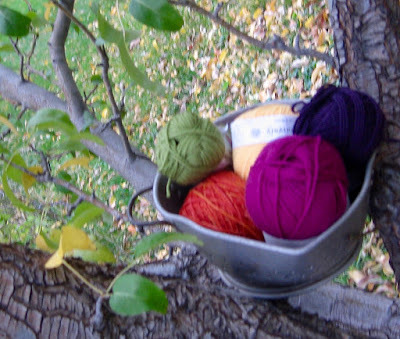 today it is ornamentally employed to hold a mix of super-wash wools that I will combine to make a couple of baby sweaters. I like the contrast of old metal and new yarn. The old and new will also come together in the sweaters--ancient Inca patterns will adorn a sweater for a baby who probably isn't even born yet. I am really looking forward to those baby sweaters because they are tiny and fast, so I can afford to use higher-level skills on them. 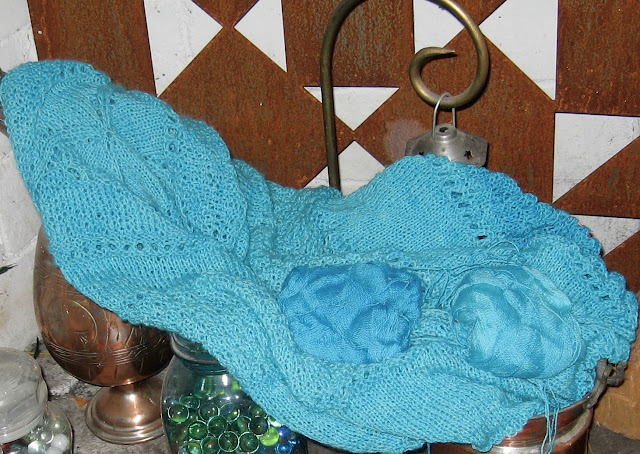 The big turquoise shawl is reaching about hip-length and working on it is really getting old. 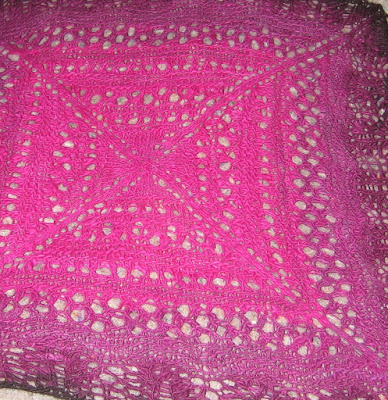 The problem with knitting circles and squares is that they start tiny, but they keep growing. So I started with 2 stitches per side. Now there are 155 (620 around). Every two times around, I add eight more stitches. So each round is slow and uses a lot of yarn. I am hoping I have enough to make the final section the right size and finish the thing off. I originally thought about lace edging, but there just isn't enough yarn or patience left. It better be finished by next week's blog. 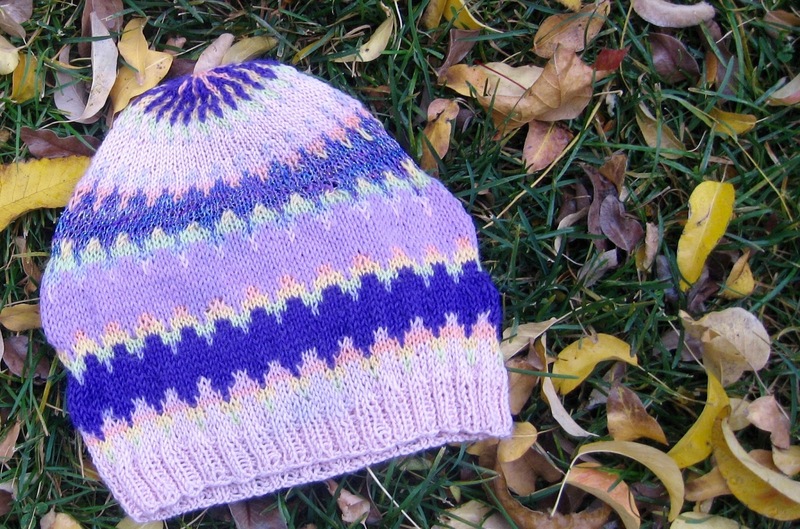 I did take a break from blue to make a cute hat. It is made of yarn samples which include wool, alpaca, silk, and acrylic. If you want it, you can find it in my shop. 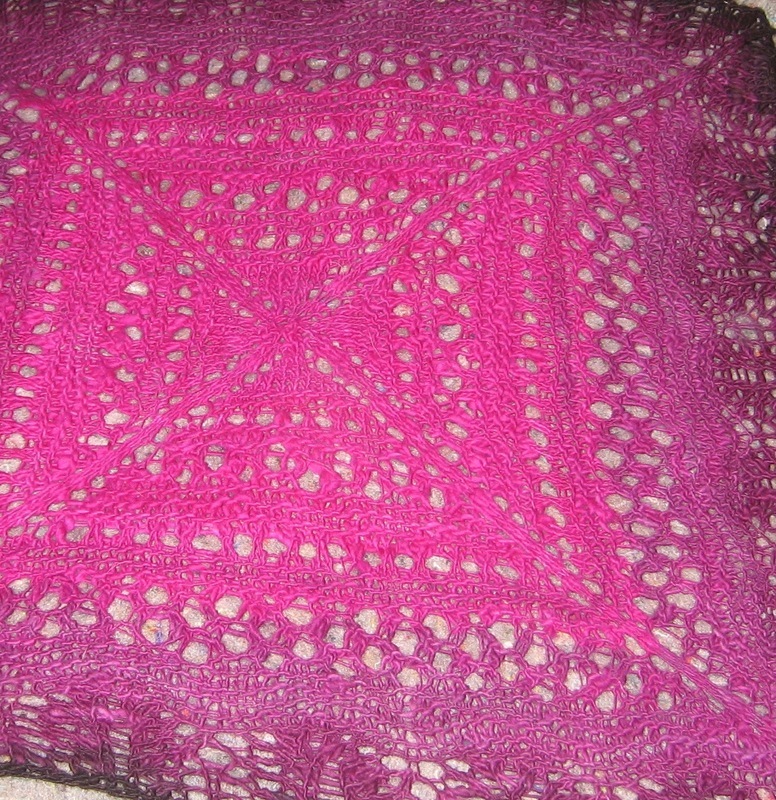 Three feet square of hot pink to maroon. Takes? I also washed and stretched the purple square I knit. It is still too small for a good shawl, but I don't want to pull it apart and start over. It would be fun to mount it and put some sort of art in the middle. But I live in a blue and brown house with very little wall space. If one of you is interested, and local, let me know. We can barter something for it.